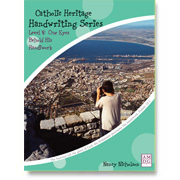 Catholic Heritage Handwriting, Level 4, suitable for fourth through sixth grade, provides cursive practice with a smidgen of tongue-in-cheek humor, in addition to classical and Church Latin language exposure as well. Top spiral bound, single sided pages. 77 pgs, 36 weeks.